We already know that a pointer holds the address of another variable of same type. When a pointer holds the address of another pointer then such type of pointer is known as pointer-to-pointer or double pointer. 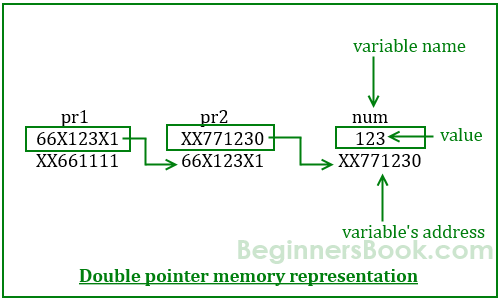 In this guide, we will learn what is a double pointer, how to declare them and how to use them in C programming. To understand this concept, you should know the basics of pointers. How to declare a Pointer to Pointer (Double Pointer) in C? Here pr is a double pointer. There must be two *’s in the declaration of double pointer. As per the diagram, pr2 is a normal pointer that holds the address of an integer variable num. There is another pointer pr1 in the diagram that holds the address of another pointer pr2, the pointer pr1 here is a pointer-to-pointer (or double pointer). Lets write a C program based on the diagram that we have seen above. There are some confusions regarding the output of this program, when you run this program you would see the address similar to this: 0x7fff54da7c58. The reason I have given the address in different format is because I want you to relate this program with the diagram above. I have used the exact address values in the above diagram so that it would be easy for you to relate the output of this program with the above diagram. Awesome explanation with figures!! My concept of pointers has never been so clear. I hope I won’t be confused any more in this field. It’s a great explanation. Thanks!! I just have one query. Since *pr1 is the value of pr2 and not its address. Is there a typo in the code for the section “Ways to find address of pointer”? The “*pr1” should be “pr1”, if &pr2 == pr1, no? Wait a minute. The address of pr2 (&pr2) is assigned to the pointer pr1. But pr1’s OWN address is NOT &pr2. Yeah jason…me oso thinking the same. As per dat logic ..it should be “pr1”. Pointer To Pointer Can Point To A Memory Locations Of A Variable Of Any Data Types. Address of Pointer pr2 using pr1 is: 66X123X1 (Wrong) according to the register you take.